Foreshadowing happens early in Shekhar Kapur's bomb, The Four Feathers. Over the wailing "Oriental" vocals, reminiscent of India, Arabia or Persia, or even just the dystopias of near-future Los Angeles, anyway, reminiscent of the Other, we watch a good ol' boy rugby match at a military training college in late 19th century England. With each tackle and toss, the characters (and their destinies) are swiftly established: the cautious Harry Feversham (Heath Ledger), his reliable and loyal BFF, Jack (Wes Bentley, spectacularly beautiful), the child-like Castleton (Kris Marshall), and his protector, Trench (MICHAEL SHEEN! ), and the guy who never listens to his mates to just pass the bloody ball, Willoughby (Rupert Penry-Jones). This juxtaposition of Eastern music set to the most stiff-upper-lip of British rituals, at the edge of Western imperialism's height, is indeed a nice moment. You can sense the blurring of boundaries, and how increasingly irrelevant Kipling's pronouncement becomes as colonies rebel and twains do, sometimes painfully, meet. It's an interesting comment on how much of British identity during the colonial period was defined elsewhere, away from the actual island. But for a film with such a broad, epic palette, the story is much less concerned with the geopolitics of Orientalism. It barely touches these themes in any meaningful way (such a shame! Mr. Kapur, why!? ), but instead it remains insular, telling its narrow story dutifully and telling it with very pretty aesthetics indeed. Mr. Kapur films some of those soul-trembling vistas with the same love and awe that dominated David Lean's "of Arabia". The reason we watched this movie. It's no Mr. India, but it'll do. The story, based on a colonial-era novel by A.E.W. Mason, explores the rocky road to redemption one scion of British imperialism must endure after he gets cold feet before his first orders to war. When Harry Feversham, one of the bright young stars in officer training, is given orders to ship from his cozy British Elysium to the harsh bloodletting in the Sudan (to replace, his superiors tell him, a British regiment which was slaughtered "to the man"), he waffles for a day or two and then resigns. No, thank you, old chap. This earns him the shock and scorn of his once-admiring loved ones. 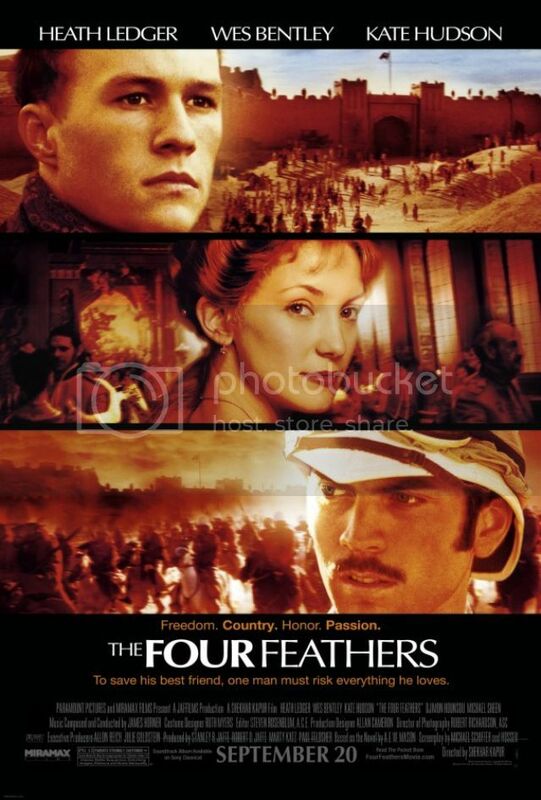 He receives four feathers, symbolizing cowardice, his fiancee breaks off the engagement and his old military father disowns him. After waffling a bit more, Harry decides it's worse to live like a social zombie and so he packs up his things and heads to Sudan anyway to see if he can earn back his manly pride. In the meanwhile, his army buddies are having a helluva time beating off the repeated guerilla attacks of a local rebel leader, Muhammad Ahmad, the self-proclaimed Mahdi. In a beautifully filmed sequence, the British forces are ambushed - just as Harry comes barelling in to warn them. He spends the rest of the film collecting his friends and shipping them home - one has been blinded, one killed, another imprisoned. Eventually, his dedication, courage and strength earn everyone's admiration again. At one point, his friend, Abou (Djimon Hounsou), laughs at him for waaay overcompensating. After Harry confesses that he is a coward, Abou starts to laugh: "When I found you, you were half-dead in the desert! Traveling alone!" Djimon Hounsou, god of the bicep and pectorals. Desert curvature. Not a right angle in sight! We could probably wax theoretical about how squares and sharp edges - Harry and his buddies are all crisp uniforms and clacking heels, and the most disastrous strategist turns out to be the one who was fussiest about keeping every hair in place - are placed in contrast to the rolling, softening dunes of the desert and the curve of Djimon Hounsou's biceps (which are glorious). No right angles here, old chaps! Similarly, Harry and Trench, in the lengthy sequence which accompanies their escape from prison, undergo radical physical changes, the sharp edges of their haircuts and jawlines are replaced by unruly beards and haphazard curls. This reminded us of a brilliant bit in Michael Ondaatje's The English Patient , when the narrator marvels at the changes undergone by the Canadian thief, Caravaggio, during his time in wartorn Italy: the exact description is that he's been "softened". British box of Britishness, part 1: the social. Part 2, the military strategy. Part 3, the very bad idea. Djimon Hounsou seems perpetually stuck in the stereotypical and limited role of the noble savage. As usual, he is dignified and physically magnificent, and our (white) heroes rely on his sympathy and aid to get them through this Foreign Adventure. Okay. Sure. Fine. When will he stop being the Other? Mr. Hounsou, please fight against this type-casting! You can be Anakin -Skywalker in our Star Wars-as-neo-dystopia remake! Heath Ledger's performance is charming and authentic, his inherent likability making even the earlier scenes, when Harry chickens out, entirely sympathetic. Wes Bentley, who disappeared from films after his smash debut in American Beauty and has now reemerged after rehab from drug addiction is almost mind-blowingly beautiful. His role is likewise built to maintain an aura of modest heroism. That said, he could have invested an interesting character with a lot more depth, but he keeps things just skin-deep. We have a soft spot for Kate Hudson, since we love Goldie Hawn, but she has absolutely nothing to do - this is a very male-only film. Wes Bentley, looking fabulously pretty. Michael Sheen, looking rough as hell. We saw this in theatres back in 2002, and remembered it only for being vaguely insubstantial and unsatisfying. Now, with the sharpening of our movie feelings thanks to this blog (yay PPCC! ), we can identify that airiness as coming from a lack of follow-through: Kapur had such an opportunity to inject this movie with passion - about politics, about colonialism, about machismo or about forgiveness - but he never really goes for it. Anyway, the reason we came back to it now was because of our Michael Sheen binge, and his role, as the clownish officer Trench, who later becomes a prisoner of war, is (we were surprised to realize!) one of the only things which we did remember well from 2002. Harry's discovery of Trench in the thronging mob of Omdurman prison is a moment of almost magical elation - and Trench's recognition of Harry is even better. Indeed, while the film frittered away a nice opportunity to say something more, it did do just service to a neat story - there are some brilliant, evocative moments centered around Harry's deception and recognition, and some moments were nice enough to yoke a tear or two. All in all, the narrative drive was fabulous, and we reckon we could use this story as an example on how to build a good plot structure when we write the book that will make us millions: Movies: A Guide to Life and Watching Movies.